John Muir died 100 years ago. Is anyone still listening? John Muir, the grand old man of the Sierra Nevada, died 100 years ago in a Los Angeles hospital bed with only an unfinished book manuscript for company.¹ He was seventy-six years old. In the final year of his life he had been stung by betrayal, losing the fight of his life: his beloved Hetch Hetchy Valley in Yosemite would soon be dammed to serve the water and power demands of a booming San Francisco.² Yet, here he was, still proselytizing—from his deathbed—on the wonders of nature. A century later, is anyone still listening? In his time Muir was a hugely popular writer, environmental activist, and a well-regarded scientist. But how many people actually read his works today? I suspect that most people recognize his name only from the parks, trails, and schools that bear his name. Although his writing was enormously popular in its day, it is somewhat florid to modern ears, as in this passage on Yosemite: “The rose light of dawn creeping higher among the stars, changes to daffodil yellow; then come the enthusiastic sunbeams pouring across the feathery ridges, touching pine after pine, spruce and fir, libocedrus and lovely sequoia, searching every recess until all are awakened and warmed.”³ Likewise, his scientific work was groundbreaking at the time, but today is considered more in line with good natural history than science. Still Muir’s influence may be felt by every Californian in the vast lands that have been set aside for wilderness, parks, and conservation areas. His science may have faced some revisions4, but Muir’s philosophy is still fundamental to our perceptions of what nature is, why it should be valued, and how it must be managed. 5, 6 How relevant is that philosophy today? Muir’s power to inspire his contemporaries—from presidents on down—was nearly supernatural. Can the old man still move us to deep contemplation or raise our hackles in passion about what nature is and how we treat it? 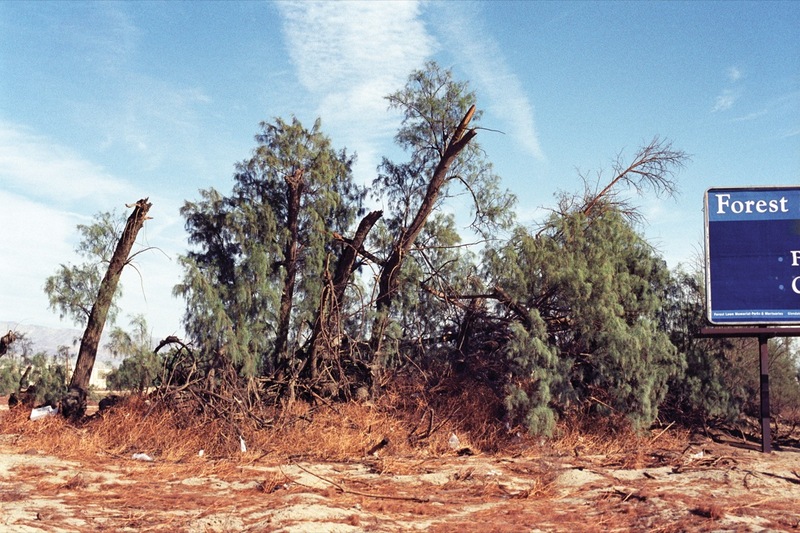 Abandoned windbreak, 2007, from LA Environs. Photograph by Barron Bixler. Muir believed that nature revealed the hand of the creator and was, therefore, superior to the works of man. He believed that animals, plants, and even rock formations must be protected against wanton destruction. In turn, immersion in wilderness, he believed, is important for the physical and spiritual health of human beings. As he wrote in his book on national parks, “Thousands of tired, nerve-shaken, over-civilized people are beginning to find out that going to the mountains is going home; that the wilderness is a necessity; and that mountain parks and reservations are useful not just as fountains of timber and irrigation waters, but as fountains of life.”7 Preserving nature is a life-sustaining quid pro quo. But federal agencies weren’t always protection-minded enough for Muir. He had a very public falling out with Gifford Pinchot, first chief of the US National Forest Service. Their initial parting was over Pinchot’s support of sheep grazing on forestlands, and the schism intensified when Pinchot became a leading advocate for the Hetch Hetchy reservoir proposal. During that battle, Muir declared: “Pinchot seems to have lost his head in coal and timber conservation, & forgotten God and his handiwork. He has been our worst enemy in our park fight.”9 At that time, wilderness “preservationists” like Muir often battled with “conservationists” such as Pinchot who believed the primary role of the nation’s forests was more utilitarian—to provide timber and other resources—rather than spiritual. Utilitarian or not, the Forest Service has protected millions of acres of California forestland. 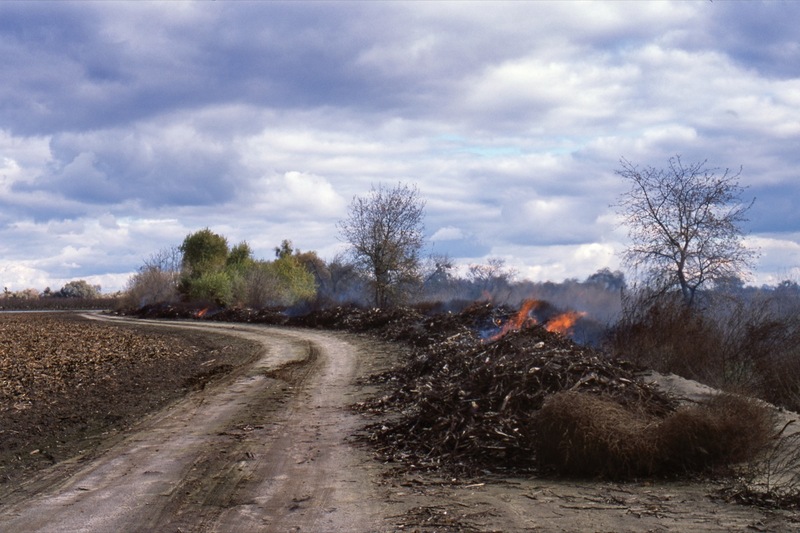 Burning Agricultural Debris, 2013, from A New Pastoral: Views of the San Joaquin Valley. Photograph by Barron Bixler. The Sierra Nevada still holds one of the most alluring places on Earth in the Yosemite Valley. East of the Sierra Crest, the oldest living trees in the world still cling to the peaks of the White Mountains. Mount Shasta in the north remains majestic, snowcapped, and forest clad. The world’s tallest trees, redwoods, still march down to the sea from ancient strongholds in Del Norte and Humboldt Counties. Much of the Mojave Desert is as remote and eerily beautiful as a century ago. California remains a state of unsurpassed natural grandeur and incredible natural diversity. The preservation of these lands over the past century would have delighted Muir, I am sure, even while problems familiar to him remain. Wild and semiwild landscapes continue to disappear under development. Managing tourists in Yosemite remains a complicated challenge. San Francisco keeps its grip upon Muir’s beloved Hetch Hetchy Valley. 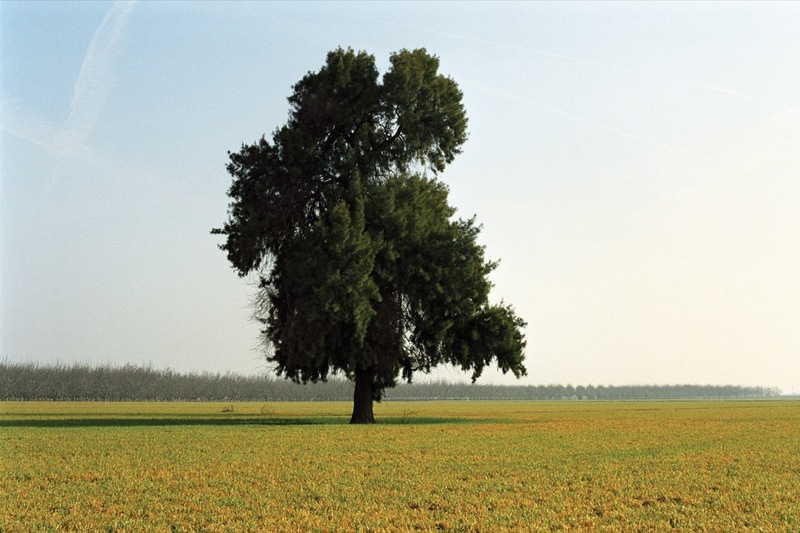 Tree in Field, 2006, from A New Pastoral: Views of the San Joaquin Valley. Photograph by Barron Bixler. Prolonged drought can cause the direct mortality of vulnerable trees, and it can also weaken their defensives against pathogens such as pine bark beetles.18 The beetles benefit from weakened trees, and they move to higher elevations and regenerate faster due to the higher temperatures. The desiccated, dead, and dying trees in turn provide fuel that promotes larger and more intense fires. 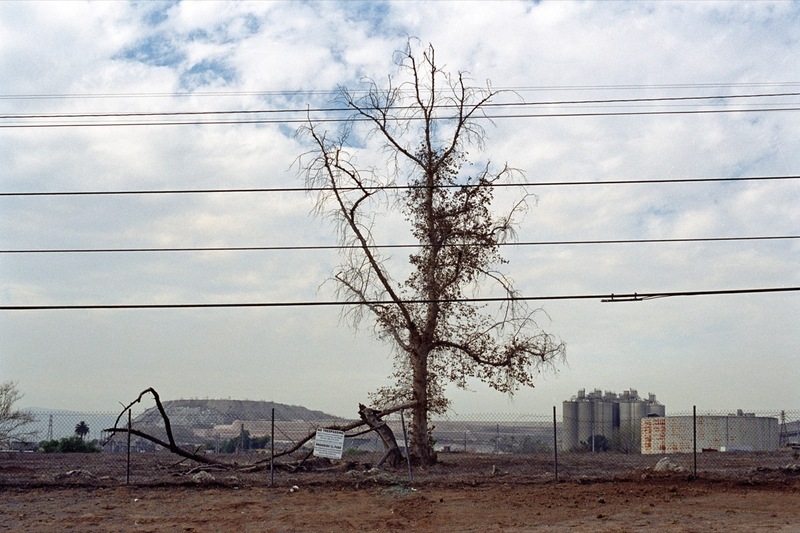 Tree, Terraformed Mountain and Industrial Buildings, 2007, from LA Environs. Photograph by Barron Bixler. At the time of Muir’s death, the population of California stood at three million people. Today the population tops thirty-eight million.23 By 2050 it is expected to grow to over fifty million.24 Although the Sierra Club—in which Muir served as founding president—has had a history of strong views among some members favoring curtailing immigration and stemming population growth, I don’t think this would have been Muir’s way. In 1901 he wrote, “The United States Government has always been proud of the welcome it has extended to good men of every nation, seeking freedom and homes and bread. Let them be welcomed still as nature welcomes them, to the woods, as well as to the prairies and plains. No place is too good for good men, and still there is room.”25 After all, Muir was an immigrant himself. 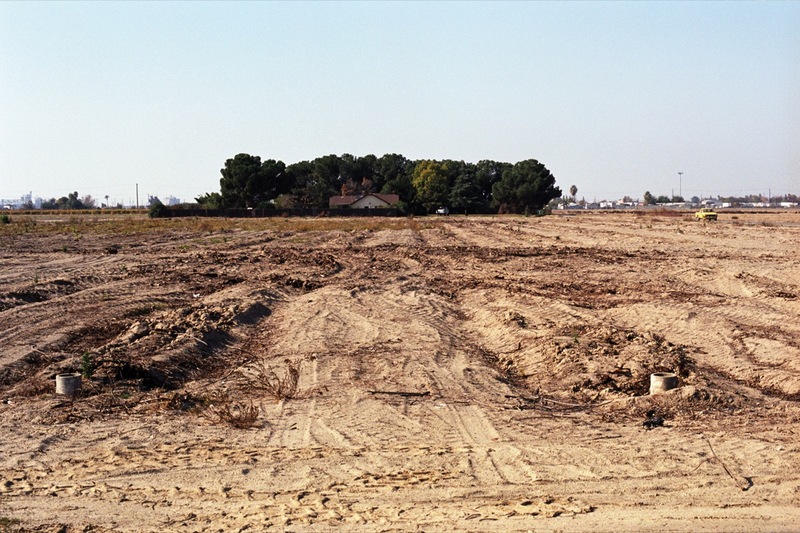 Brownfield Site, 2007, from A New Pastoral: Views of the San Joaquin Valley. Photograph by Barron Bixler. What did Muir have in mind? I cannot find in his writings any definitive guidance for striking a balance between tourism and preservation, or people’s needs for living space and wilderness, or which lands should be developed and which should be preserved. Muir fought to preserve what he personally found beautiful and otherwise interesting. In general, this meant scenic mountains and forests. Muir’s bias has remained in place and influenced the selection of national parks over much of the past century. But in the twenty-first century, as we become more sensitive to the preservation of biodiversity and understand how geography and genetics shape species, the limitations of Muir’s seemingly subjective criteria have become more and more apparent. The geographic areas that support species that we hope to preserve may shift outside the borders of our current parks as the climate changes. At the same time, increasing demands on resources will mean that economic and resource constraints that are imposed by setting aside lands will need to be carefully balanced. We need a new set of criteria for preservation and conservation, which in our time have come closer to meaning the same thing. Will Muir’s legacy—the current national park system and network of other federally protected wilderness areas—survive through the twenty-fist century? It will depend on our capacity and will. In 1914, the US federal debt stood at about 4 percent of the nation’s gross domestic product. Today the public federal debt stands at 70 percent of GDP.28 It comes as no surprise that in a time of declining governmental financial capacity some conservative politicians have called for the sale of some of our national parks and other federal lands. 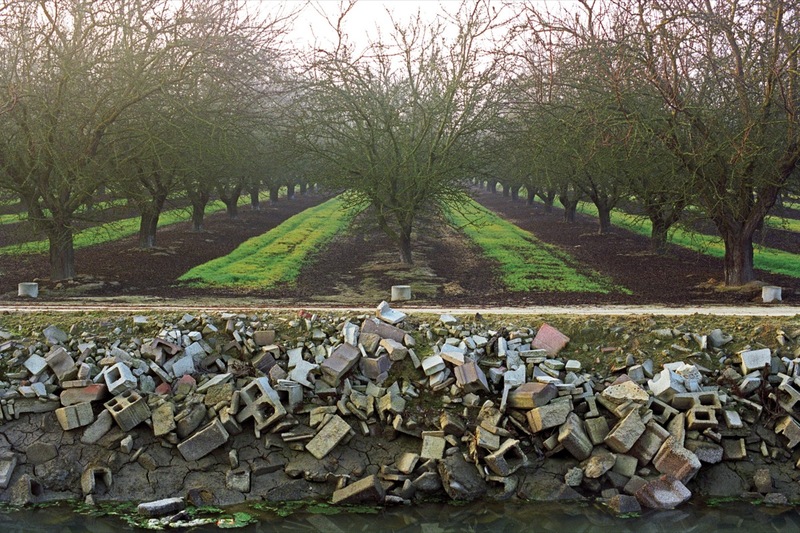 Orchard and Irrigation Ditch, 2007, from A New Pastoral: Views of the San Joaquin Valley. Photograph by Barrom Bixler. Muir knew there would always be those who disagreed with his preservation values. He had an innate distrust of the elite and particularly the economically powerful. What kept him going was a faith in the transformative power of exposure to nature. He believed that visiting places like Yosemite would promote greater health and happiness for the American population and greater public support for parks. His message was tailored to the Anglo-American world of a century ago. That strategy worked, and the US national park system is its fruit. But, today, we see a worrying trend. With the nation’s changing ethnic demography and economics some researchers predict that this could lead to a decrease in the proportion of Americans visiting wilderness areas and parks such as Yosemite.29 One wonders if this could ultimately lead to an erosion of broad public support for parks, wilderness, and conservation. Bringing more people to Yosemite—as Muir might have suggested—may no longer be the best way to ensure societal value of the natural world. An alternative is to bring nature to people through urban parks, open spaces, and wildlands at the edges of cities. This can be done in a way that sets aside new land for conservation that is accessible for an urban population and affordable for cash-strapped agencies to oversee, as we’ve seen with the Santa Monica Mountains Conservancy in Los Angeles. Through a joint partnership of federal, state, and local government and private parties, 450,000 acres have been put aside for conservation and recreational uses. The capacity and cost for management is shouldered by multiple partners making the costs more affordable for each. In many ways, this is a model for the future. This experience of nature may be different than Muir envisioned in his preoccupation with remote wilderness parks such as Yosemite, but he was an innovator and a realist. I think he would have seen the value in such arrangements. 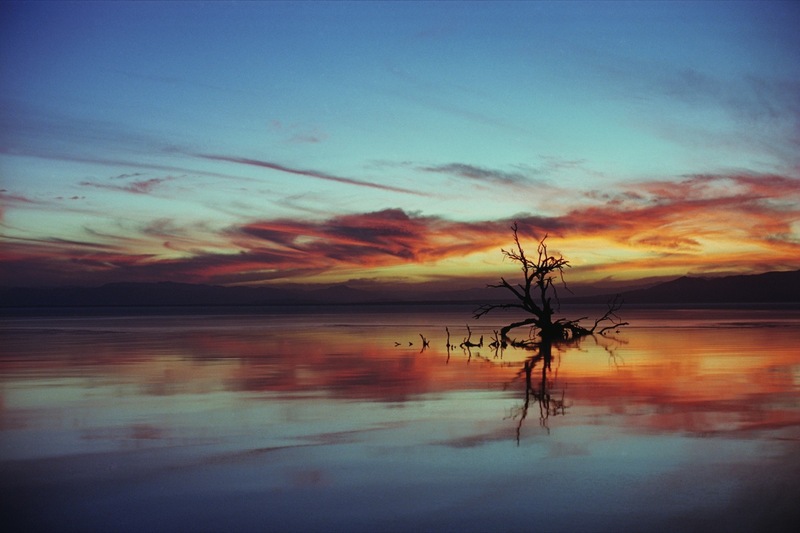 Salton Sea, 2007, from LA Environs. Photograph by Barron Bixler. I think we can find practical solutions to twenty-first century conservation problems very much in the spirit of Muir’s work. But what about Muir’s work itself? Can his writings and deeds continue to excite and incite despite the century between us? I’ve read much of what Muir wrote. His unbridled enthusiasm for the mountains and forests of California is at once naïvely optimistic by modern standards and completely infectious. It made us remember the same naïve exuberance of childhood and adolescent adventures in Yosemite and the Sierra. I also reflected upon his darker writings regarding Hetch Hetchy and the loss of that battle in the final year of his life. I thought about how he might have retained his faith that the people were with him even if the vested interests were not. Yet In 2012 when San Franciscans voted on a proposal to study the potential to restore Hetch Hetchy Valley, 77 percent rejected the idea. Muir would have been crushed. Thanks to Hollis Lenderking, UCLA Class of 1971, for his vision and generous endowment of the John Muir Memorial Chair in Geography at UCLA and support for this issue of Boom and the Muir Symposium, “A Century Beyond Muir.” Thanks to my parents, Walter and Mildred MacDonald, for taking me to Yosemite over the years and through the seasons and thus planting the seeds that led to a life of working in the Sierra Nevada and many other wild places around the world. 1 Historical facts regarding and insights into the life and philosophy of John Muir are drawn from Edwin Teale, The Wilderness World and John Muir (Boston: Houghton Mifflin Company, 1954); Holway Jones, John Muir and the Sierra Club: The Battle for Yosemite (San Francisco: The Sierra Club, 1965); James Clarke, The Life and Adventures of John Muir (San Diego: The Word Shop, Inc., 1979); Dennis Williams, God’s Wilds: John Muir’s Vision of Nature (College Station: Texas A&M Press, 2002); Donald Worster, A Passion for Nature: The Life of John Muir (Oxford: Oxford University Press, 2008). 2 See Holway R. Jones, John Muir and the Sierra Club: The Battle for Yosemite (San Francisco: The Sierra Club, 1965); Robert W. Righter, The Battle Over Hetch Hetchy: America’s Most Controversial Dam and the Birth of Modern Environmentalism (Oxford: Oxford University Press, 2005). Calls to remove the dam and restore the valley continue. See Dan Lungren and John Van de Kamp, “Restore Yosemite? It Can Be Done.” Los Angeles Times, 3 December 2013. 3 John Muir, Our National Parks (Boston: Hughton Mifflin, 1916), 90. 4 François Matthes, François Matthes and the Marks of Time: Yosemite and the High Sierra, Fritiof Fryxell, ed. (San Francisco: The Sierra Club, 1962); Jeffry Schaffer, The Geomorphic Evolution of the Yosemite Valley and Sierra Nevada Landscapes: Solving the Riddles in the Rocks (Berkeley: Wilderness Press, 1997). 5 Robert Righter, The Battle Over Hetch Hetchy: America’s Most Controversial Dam and the Birth of Modern Environmentalism (Oxford: Oxford University Press, 2005). 6 Daniel Philippon, Conserving Words: How American Nature Writers Shaped the Environmental Movement (Athens: University of Georgia Press, 2005). 7 John Muir, Our National Parks, 3. 8 California Protected Areas Database (CPAD) Statistics Report for March 2014, accessed 7 June 2014, http://www.calands.org/uploads/docs/CPADStatisticsReport_2014a.pdf. 9 Letter from John Muir to [Henry F.] Osborn, 8 February1910. University of the Pacific Holt-Atherton Special Collections, accessed 7 June 2014, http://digitalcollections.pacific.edu/cdm/ref/collection/muirletters/id/7567. 10 Katharine Hayhoe et al., “Emissions Pathways, Climate Change, and Impacts on California,” Proceedings of the National Academy of Sciences of the United States of America 101, no. 34 (2004): 12422–12427. 11 Cal-Adapt developed by UC Berkeley’s Geospatial Innovation Facility (GIF) with funding and advisory oversight by the California Energy Commission’s Public Interest Energy Research (PIER) Program, and advisory support from Google.org. Data from Scripps Institution of Oceanography California Nevada Applications Program (CNAP), accessed 7 June 2014, http://cal-adapt.org/temperature/century/. 12 S.E. Godsey et al., “Effects of Changes in Winter Snowpacks on Summer Low Flows: Case Studies in the Sierra Nevada, California, USA, Hydrological Processes DOI: 10.1002/hyp.9943 (2013). 13 William Cornwell et al., “Climate Change Impacts on California Vegetation: Physiology, Life History, and Ecosystem Change,” California Energy Commission Publication number: CEC-500-2012-023 (2012). 14 John Muir, “On Actual Glaciers in California,” American Journal of Science and Arts, Third Series, (1873), 69–71. 15 John Muir, The Mountains of California (New York: The Century Company, 1894). 16 Bill Guyton, Glaciers of California: Modern Glaciers, Ice Age Glaciers, Origin of Yosemite Valley, and a Glacier Tour in the Sierra Nevada (Berkeley: Univ. of California Press, 2001). 17 Hassan Basagic, cand A. G. Fountain, “Quantifying 20th Century Glacier Change in the Sierra Nevada, California,” Arctic, Antarctic, and Alpine Research 43 (2011), 317–330. 18 Alejandro Guarín and Alan H. Taylor, “Drought Triggered Tree Mortality in Mixed Conifer Forests in Yosemite National Park, California, USA,” Forest Ecology and Management 218 (2004), 229–244. 19 Alejandro Guarín and Alan H. Taylor, Forest Ecology and Management (2004). 20 Williams, A. Park et al., “Forest Responses to Increasing Aridity and Warmth in the Southwestern United States,” Proceedings of the National Academy of Sciences 107 (2010), 21289–21294. 21 Constance Millar et al., “Climate Change And Forests Of The Future: Managing in the Face of Uncertainty,” Ecological Applications 17 (2007), 2145–2151. 22 John Muir, “On the Post-Glacial History of Sequoia Gigantea,” Proceeding of the American Association for the Advancement of Science, Buffalo Meeting (August 1876), 3. 23 California Department of Finance, “E-7. California Population Estimates, with Components of Change and Crude Rates, July 1, 1900–2013,” accessed 8 June 2014, http://www.dof.ca.gov/research/demographic/reports/estimates/e-7/view.php. 24 California Department of Finance, “New Population Projections: California To Surpass 50 Million in 2049,” accessed 8 June 2014, http://www.dof.ca.gov/research/demographic/reports/projections/p-1/documents/Projections_Press_Release_2010-2060.pdf. 25 John Muir, Our National Parks p 391. 26 Letter from John Muir to [Jeanne C. Carr],  May 29, University of the Pacific Holt-Atherton Special Collections, accessed 8 June 2014, http://digitalcollections.pacific.edu/cdm/ref/collection/muirletters/id/11718. 27 Karen Klein, “On Hetch Hetchy, John Muir Was Wrong,” Los Angeles Times, 15 August 2012. 28 US Government Accounting Office, “Federal Debt Held by the Public as a Share of GDP (1797–2012),” accessed 8 June 2014, http://www.gao.gov/assets/670/661580.pdf. 29 James Bowker et al., “Wilderness and Primitive Area Recreation Participation and Consumption: An Examination of Demographic and Spatial Factors,” Journal of Agricultural and Applied Economics 38 (2006), 317–326. 30 John Muir, The Yosemite (New York: The Century Press, 1912), 261–262.